Hello- you are likely here because you have booked to travel to Bali or the surrounding Indonesian islands and are wanting answers to the question “is Bali safe?“. We were stuck in Bali throughout many earthquakes due to our 5 year old’s serious head injury; she was medically unfit to fly out and the whole experience was pretty horrendous. All the information I have put together about the earthquakes/tsunami, and my personal opinion about whether it is safe to travel to Bali, is in this post. 3 DECEMBER 2018 UPDATE: Is Bali safe after the earthquake, eruption and tsunami? July 2018 Blog Diary Entry- The First Earthquake. Hi guys. This morning (July 2018) we were woken at around 6.45am by a rumble and shaking. Initially I thought one of the kids was playing a prank, and mumbled “stop it! Guys, stop it!” before waking up to realise our bed was banging against the wall. There have been two earthquakes in the past 12 hours, with the epicentre being reported to be on Lombok, although there are also suggestions that an epicentre of one was on Java. These are both islands near to Bali which is why we felt the shakes. Update 5th August: There has just been a 6.8 earthquake with the centre in Lombok. It was big and scary but we haven’t heard anyone injured on Bali island yet. There is no current tsunami warning. Update 7th August– Over 100 people are confirmed dead after the earthquake, I don’t know if any of these were on Bali but the majority are on Lombok, with a few on the Gili islands. Over 1000 people were stranded on the Gili Islands with no electricity and I believe the national search and rescue service are working today to get them back to Bali. Streets in Bali have been damaged; it seems to be the biggest earthquake people can remember here. Update August 23rd: There have been many Bali earthquakes in the past couple of weeks, most of them with the epicentre in Lombok. I would definitely advise against travel to Lombok or the Gili islands at this time due to ongoing quakes. Bali had its first nearby earthquake (of this recent ‘set’) this morning, about 100km south of the island in the ocean, measuring 5.5. If you are of a nervous disposition I would advise against travelling to Bali at this time- many people are suffering from a psychosomatic condition known as ‘earthquake sickness’, where the constant tremors and frequent quakes induce dizziness and a feeling of shaking even when there is no quake. It is not pleasant. If you are travelling to Bali I would advise researching tsunami red and yellow zones and ensure that you are not staying in a red zone. There is no current warning for a Bali tsunami in 2018. We live in a yellow zone and again it is not a pleasant feeling. Life here is going on as normal but it is making people nervous. Update October: There has been no tsunami warning reported in Bali and a few people are often keeping an eye down on the shore to look out for unusual ocean activity. Unfortunately since the tsunami in Sulawesi it has become apparent that the tsunami warning system, which is supposed to sound a loud alarm along the beachfront should a tsunami be triggered, is deeply flawed. It did not work at all in Sulawesi, leading to hundreds of unnecessary deaths of people who were holding a ceremony on the beach. The fact is that we cannot give you an objective answer as earthquakes and tsunamis are unpredictable. If we were in Bali now I would be ensuring that we were nowhere near the coast for several hours after an earthquake. Injuries on Bali island from the earthquakes have been minimal, but there have been hundreds of reported deaths and injuries on Lombok island, several thousand deaths from the earthquakes and tsunami and Sulawesi, and unstable structures as well as single storey buildings are said to have crumbled. DECEMBER 2018 UPDATE: Is Bali safe after the earthquake, eruption and tsunami? There has recently been a volcanic eruption which appears to be the cause of a tsunami in Java, Indonesia. This has caused significant damage including tens of deaths. Indonesia is in the notorious “Ring of Fire” which is an extremely active area for volcanic eruptions, tectonic plate movements that cause earthquakes, and tsunamis. There is no accurate and safe way of reliably predicting when and where the next eruption, earthquake or tsunami would be (if there were, there would be no deaths or injuries resulting from them). Unfortunately if you are wanting to know if visiting Indonesia is safe, the answer is that it is always a risk. There is no way to visit Indonesia and be completely safe from earthquakes, tsunamis or volcanic eruptions. There are of course things that you can do to minimise potential effects such as staying away from the beach and volcanos, although this of course does not stop earthquakes or potential disruption to your trip. We have friends living happily in Bali with their families, so not everyone is put off by this. It is really a completely personal decision. Lots of people have been asking “Is Bali safe?” in the past year especially due to Mount Agung erupting… and then stopping… and then erupting again. I previously stated that we felt safe in Bali, even during the earlier earthquakes. However, having been through several weeks of earthquakes and knowing that the tsunami warning system is very likely broken, I would be much more cautious. I hope this is helpful. If you found this post useful or interesting please share it with others using the buttons below! 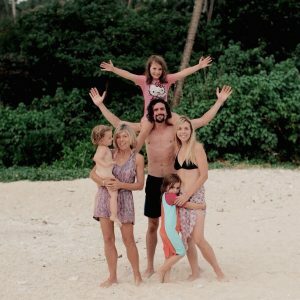 I found your post useful as we have organised to traVel to bali with our chiLdren (4 and 1.5) on the 2nd of August. I am concerned after reading the news and particularly feAring tsunamic activity. I would apprEciate any information as we near the date. Hi Nikki, thank you for your comment and I’m glad it helped you decide to come. We are in Sanur and all is well and normal here, I hope you have a great holiday! We were suppose to fly to bali tomorrOw (1/8/2018) but dUE to the recent earthquake in lombok. We were thInking of canceling our trip TO bali. But after reading your blog, it might Change our minds. Can you tell me a little bit more on the current condition in bali in terms of the businesses the are they still on going per normal? Has the earthquake triggered a warning for tsunAmi? Are the people there in A panic state? Any info will be a great help. Thanks!